How Important is Seminary Accreditation? When you explore a seminary or graduate school's website, you will typically find a page describing a list of organizations by which the school is accredited. 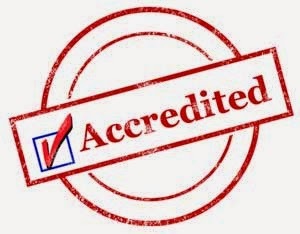 But, what does accreditation mean, exactly? And how important is seminary accreditation? A great example of a seminary that has pursued accreditation in order to demonstrate legitimacy, recognition, and high standards is Rockbridge Seminary, a member of the 4:12 Network. Rockbridge Seminary pursued accreditation as an online seminary because they recognize that studying online opens educational opportunities that normally would not be available to many learners. Rockbridge's seminary programs allow you to learn according to YOUR schedule, not the seminary’s schedule. Rockbridge’s practical learning approach utilizes the web to deliver a relevant divinity program as you study God’s word. Rockbridge Seminary offers four academic programs. Each program is designed to help prepare students for ministry leadership through learning experiences that allow them to study and practice without leaving their ministry field. Has clearly defined and stated mission, goals, and objectives. Has reasonably attainable and clearly stated educational objectives and educationally sound and up-to-date courses/programs. Demonstrates ample student satisfaction and achievement including an outcomes assessment plan. Has qualified faculty and competent administrators and staff. Has fair admission policies and adequate enrollment agreements. Is financially able to deliver high quality educational services. Has fair and equitable tuition refund policies. Has adequate facilities, equipment, and record protection. Conducts continuous research and self-improvement studies. Obviously there are schools, some which are excellent and some that are not so excellent, who have intentionally chosen not to pursue accreditation, and there are other schools that are in the process of meeting the standards for accreditation. But, Rockbridge Seminary is an example of a school that chose to pursue accreditation because they desired to demonstrate their standards of excellence. I know individuals who attended seminary, yet struggled with achieving any kind of success in ministry. And, I have dear friends who are extremely successful in ministry who never attended seminary. Therefore, I must acknowledge that graduating from an accredited school does not guarantee someone will be effective in ministry. It does, however, communicate to a church or other ministry organization that an individual has pursued studies in order to achieve some level of excellence. Obviously an individual's academic achievements must also be measured along side his or her ministry experiences or potential. If you desire to pursue an academic degree, a school's accreditation should weigh heavily on your choice of schools. If you are searching for someone to fill a ministry position, you should vet all degrees listed on a resume by checking out each school to see if, whether accredited or not, you feel the degree measures up to your standards.